As valuable as escapist entertainment can be, we also need to pay attention to the pressing real-world issues that are shaping/destroying our world. Vertigo’s Border Town engages with serious themes of racism, xenophobia, immigration, and cultural identity, but it has a playful, fantastic spirit that makes it a refreshing entertainment oasis in a time of overwhelming anxiety about humanity’s future. 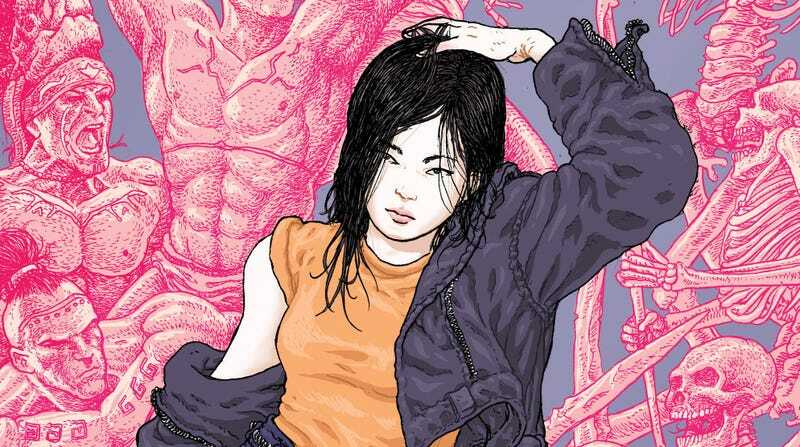 While the Sandman Universe books have turned to the legacy of Vertigo Comics to revive the struggling imprint, Border Town has re-established Vertigo as a place for engaging original ideas by creators with distinct perspectives. Writer Eric M. Esquivel, artist Ramon Villalobos, and colorist Tamra Bonvillain have crafted a series with compelling young characters, a fully realized environment, and a story that smoothly balances the personal with the cosmic. Villalobos and Bonvillain create a spectacular mystical realm, one populated by deities and demons designed with reverence for both bold superhero visuals and beautiful Mexican folk art. The cover of this week’s Border Town #3 highlights the detail that goes into both Villalobos’ line work and his designs for historical and contemporary figures, and that detail doesn’t come at the expense of personality and atmosphere. These preview pages from Border Town #3 reinforce the book’s political point of view with a flashback to colonialists stealing land from the native Aztecs, which segues to a scene of I.C.E. agents arresting a cook in present-day Arizona. The line work and coloring work especially well to set the tone in these pages, with Villalobos’ scratchy hatching and Bonvillain’s amber palette giving the art an aged, weathered look. There’s a sense of calm in the first page introducing the Aztec people, but that is is interrupted by the arrival of two death gods, who bring a wave of tension with bright blue and red coloring. That golden luster of Aztlan’s past has completely faded by the time the preview catches up to reality, and this art team consistently makes intelligent, strong choices that enrich Esquivel’s script.